Redbud Farm Equestrian: We have arrived! We left Starkville just about three weeks ago and it wasn't soon enough! The phrase 'Mississippi mud' doesn't exist without good reason. 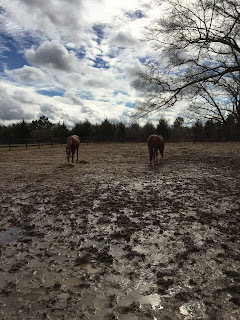 When we left the mud was up to the horses fetlocks and it is like clay so it sticks and doesn't come off. The horses were miserable. We were miserable. 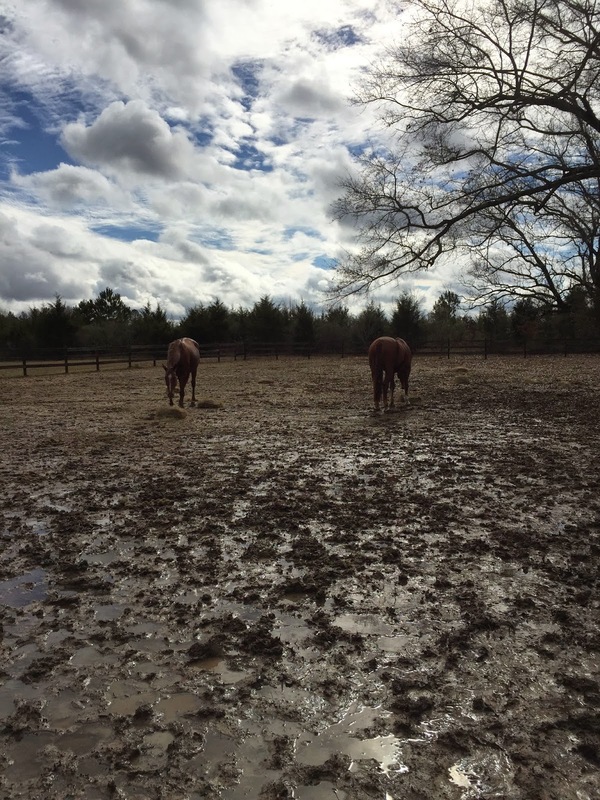 You can't really ride because it is so sloppy, so you end up doing a lot of long walks or trotting up and down the driveway. You can only take so much trotting up and down the driveway. The horses come down here to Beechwood Farm and they are just happy. Sometimes they are also a little wild, but that usually subsides pretty quickly. They get a lot of turn out and the ground in sandy so even if it does rain, the footing doesn't fall to bits, and there is always a pretty view afterwards. We have fourteen horses here this year. 12 of these are in full time work. The program or the horses in full time work is made up of flat work days, jumping days, conditioning days, and hacking days. We are very close to a number of great places to go trail riding. This is awesome for the horses to get a change of scenery. It is also to great for conditioning, which can get tiresome is you're just trotting or cantering around the same field a million times. We're very close to our dressage trainer, Anna Marek. The big horses have been over a couple times for a tune up and it is amazing! Anna has a way of getting right to the heart of the matter and dealing with the problem without the horses getting frazzled or over faced. And she can do it with ALL different types of horses. There are few people we've worked with that are so helpful in such a short amount of time. Plus she's just lovely to be around. We're looking forward to trying to get her to come teach for a day at Beechwood. Stay tuned for more information. We've also been able to take advantage of the local schooling shows. Longwood has Tuesday jumper shows and the Florida Horse Park has Winter Wednesdays this year. The courses start at 2'3" and go up as high as you'd like. It's a great way to knock some rust off before we head to our first event in another week. It's still a lot of work, but the sunshine and good footing sure makes it more enjoyable!